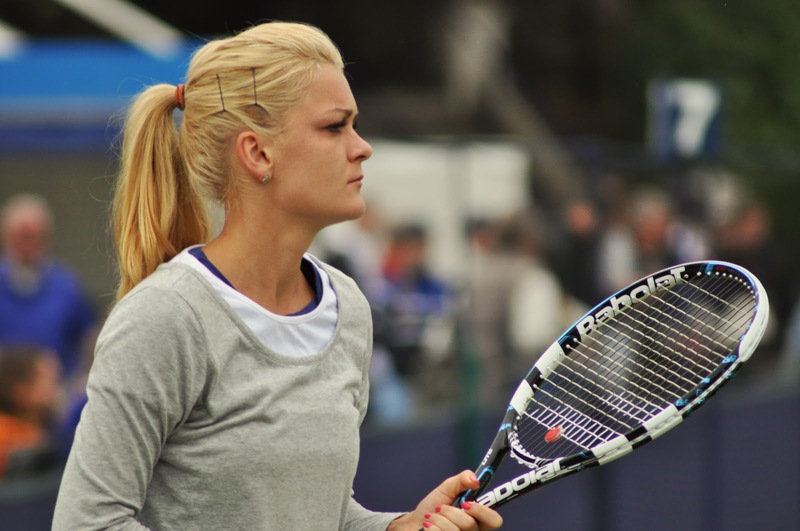 I started off at the practice courts, which were extremely busy throughout the morning. When I arrived, I saw Yanina Wickmayer, Klara Zakopalova (surprisingly with a smile) and Caroline Wozniacki, who was sporting a rather hideous pair of orange leggings. 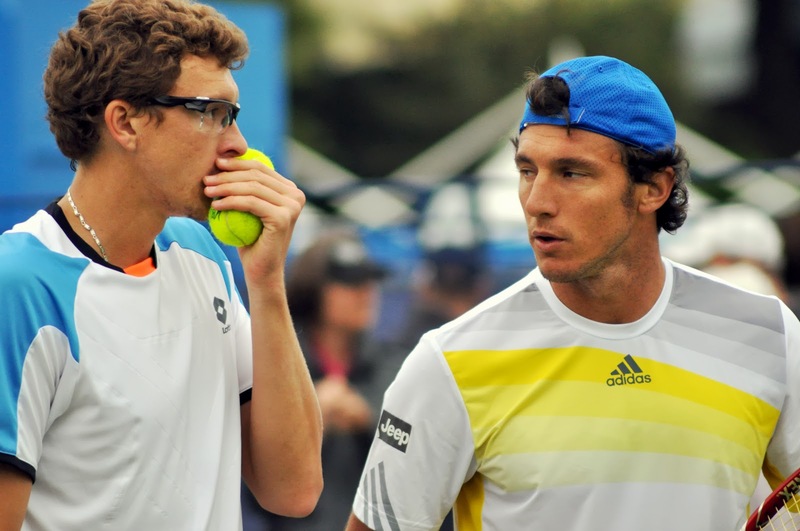 Piotr was still there and is obviously still Caroline’s coach. As usual, she was getting a lecture after practically every ball she hit. Agnieszka Radwanska also joined the practice courts and managed to get through a huge box of tennis balls with her equally huge coach, Tomasz Wiktorowski. Petra Kvitova was knocking up with Alize Cornet and I wasn’t that impressed by Kvitova who was getting the runaround by Alize. 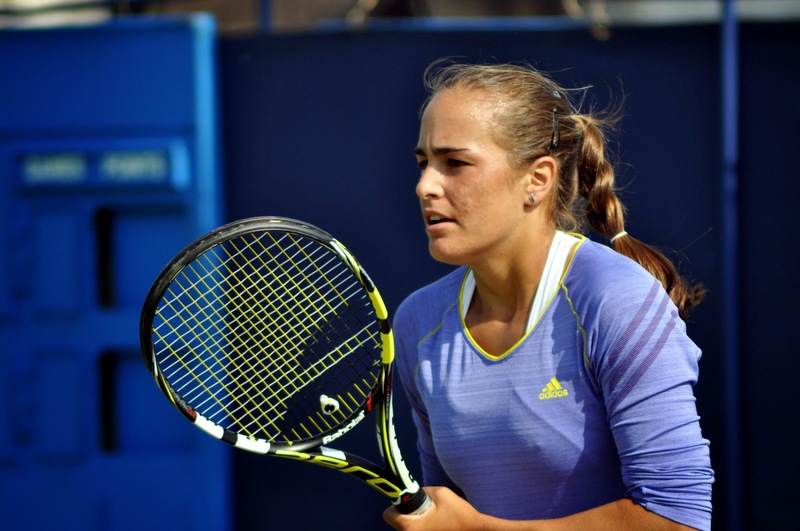 Monica Puig turned up in the afternoon and was being coached by Darren Cahill. Lucie Safarova was practising with Ekaterina Makarova, meanwhile I saw Melanie Oudin out hitting with her coach. I also saw Taylor Townsend doing some fitness drills by Centre Court. 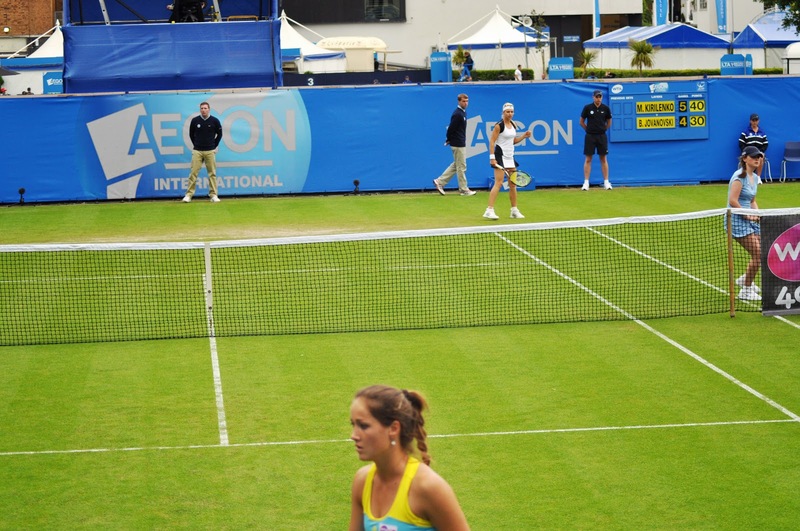 One of the best things about Eastbourne is how accessible the practice courts and you can easily get to the front. The one downside is the black netting, which does makes it difficult to take good photos. I made my way round to Centre Court for the first match of the day between Ana Ivanovic and Elena Vesnina. I had gone for the North Stand this year and was happy with my seat in Row C. The players came out to practice, but were quickly forced off due to a 45 minute rain delay. When the players came out again, Ivanovic started the match in style, racing out to a 4-0 lead hitting a load of winners and eventually closing out the first set comfortably, 6-2. Her form though rather tailed off in the second and third sets as Vesnina steadily improved throughout the match and started to string some great points together. Vesnina tried to throw it away in the third set losing her first break with a terrible service game featuring 3 double faults, but Ivanovic was missing a spark and looked rather dejected and frustrated at times. Vesnina was actually bossing the rallies and although Ivanovic had some opportunities to prolong the match at the end, Vesnina was good value for the win. I watched the conclusion of the match between Yanina Wickmayer and Christina McHale out on court 2. Wickmayer ran out a 6-3 6-4 winner and she had too much firepower for McHale, who was playing OK. The American was complaining at a call on the penultimate point and then on match point, Yanina’s serve was originally called out, but then corrected. 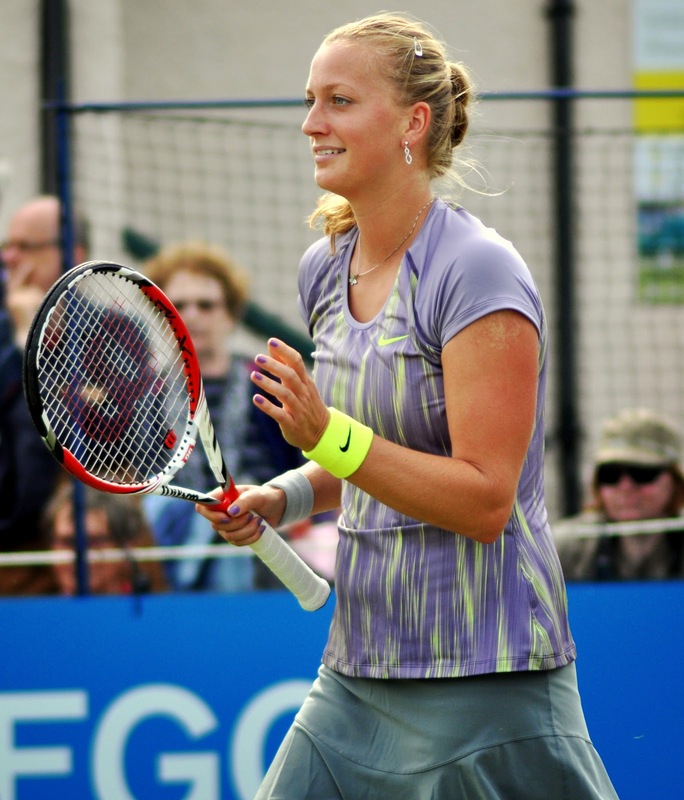 Wickmayer was understandably delighted with the win. I headed back to Centre and began watching midway through the first set of the match between Heather Watson and Varvara Lepchenko. To be honest, it was pretty terrible. Lepchenko offered up her usual infuriating lack of rhythm and looked disinterested throughout the entirety of the match. Watson really struggled on return, but saved a break point midway through the second set and was able to peak at the end of the second set to win it, 6-4 6-4. She was really pumped for the win and the crowd were really enthusiastic for her victory. I wasn’t particularly interested in watching the third match on Centre so I went and watched some of the final qualifying match between Melanie Oudin and Olga Puchkova. I started watching as they began the third set and it was a real humdinger with some really tough rallies. Both players lost their rag; Puchkova felt she had been hard done by on a number of calls and yelled out hallelujah when the line judge did call a ball out (more from her in my next post too). Oudin was also pretty fiery and one of her shots was called out very late by one of the line judges, which prompted her to scream out “latest line calls here ever”. 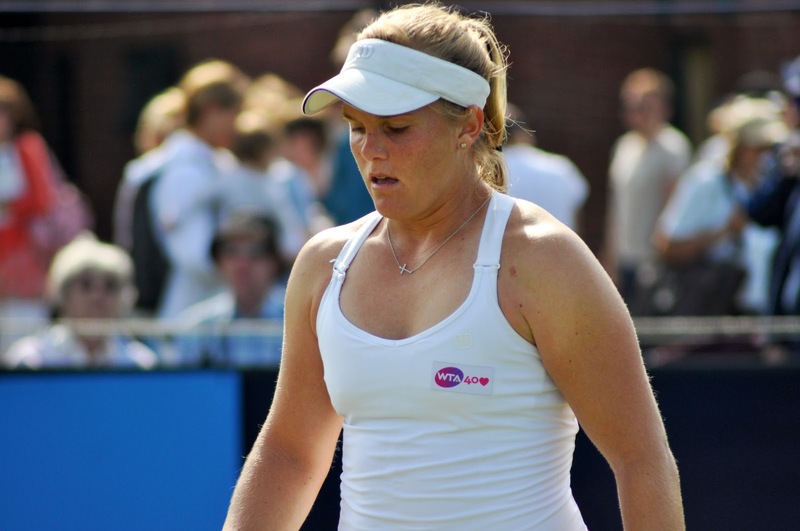 In the final game, when Puchkova broke Oudin to win the match, the American was aggrieved at a ball she felt was out and complained to the umpire that “you’ve overruled in every other part of the court”. To Oudin’s credit, she gave a really classy handshake to Puchkova. I don’t know why but I have a thing about the handshake; I think you can tell who are the nice players and who aren’t! I was disappointed for Melanie as I wanted her to win this match. I caught the first five games of the doubles match featuring Yanina Wickmayer and Petra Kvitova up against Mirjana Lucic-Baroni and Hsieh Su-Wei. It was nice to see Petra smiling, but she was having a pretty rough day on Monday and was certainly struggling for form. 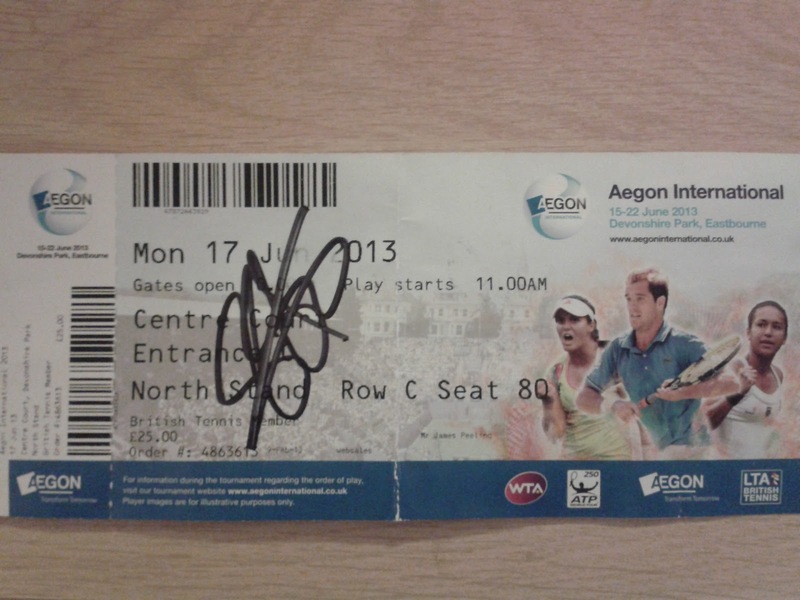 There were no real notes of interest other than Wicky and Kvitova are obviously good friends. The 3rd match on centre finished and I decided to take the brave choice to go and watch the match between Fernando Verdasco and Alexandr Dolgopolov. 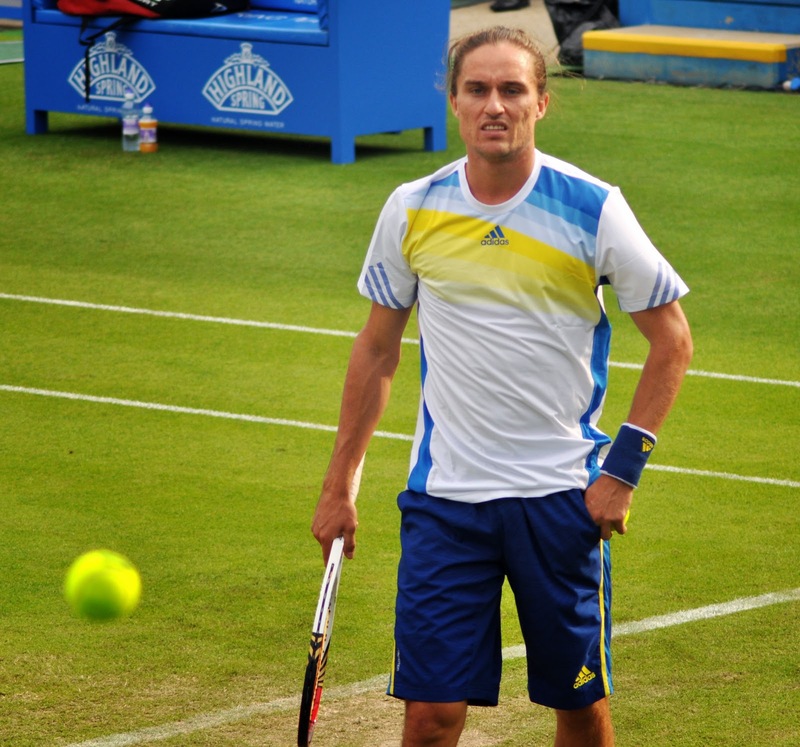 The first set was hilarious as Dolgo raced out to a 5-0 lead in just 13 minutes. There were a few good points at the end of the set, but it was largely forgettable. 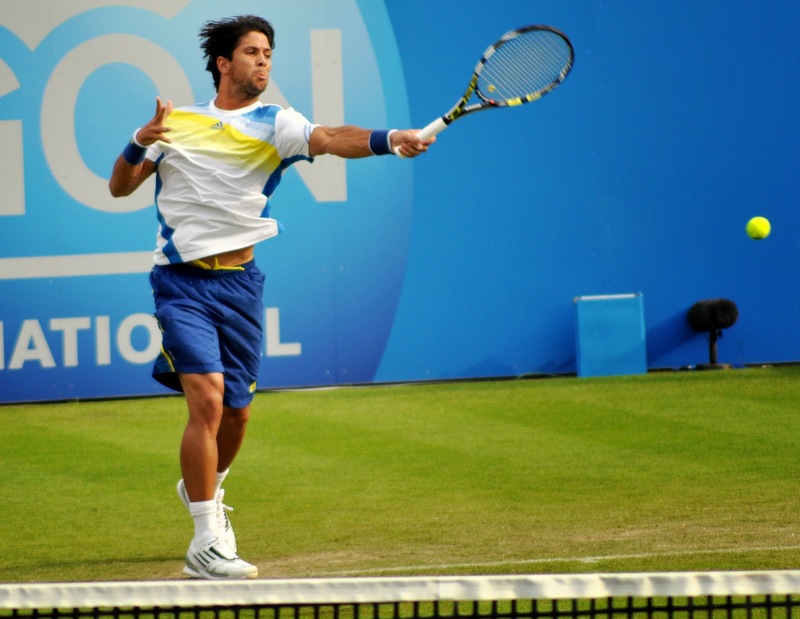 Verdasco did decide to turn up in the second set and forced a decider. 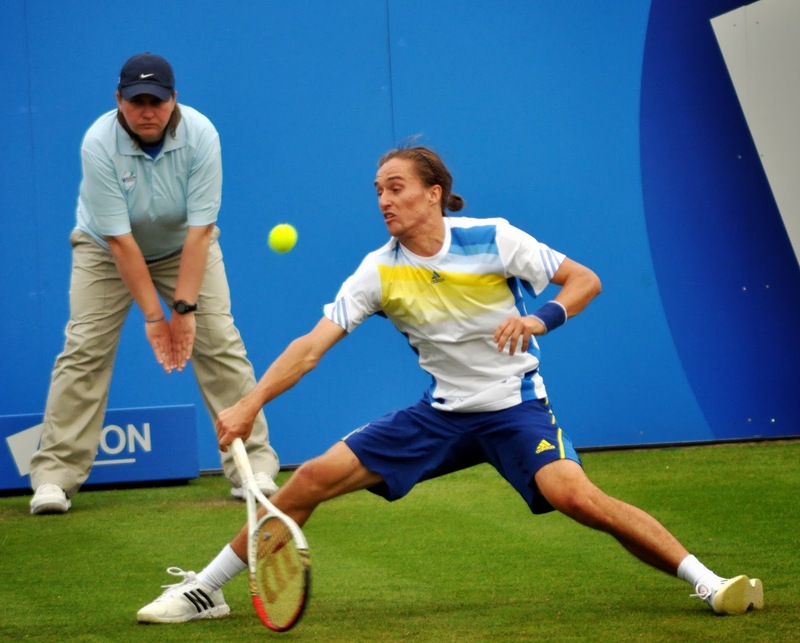 I was really intrigued to watch Dolgopolov play and he was alot of fun. His serve cracks me up every time. I tried getting a picture of it, but its so darn quick. His slices and defensive skills were pretty incredible at times and he was frequently darting and sliding around the court. 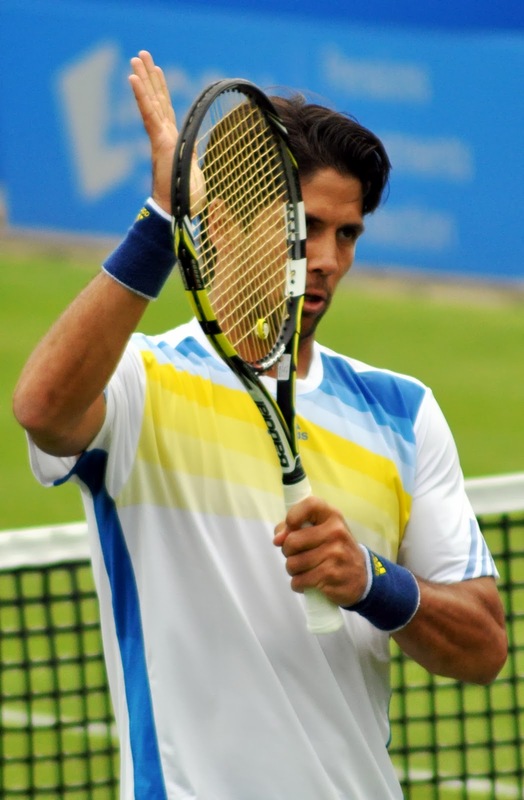 I was surprised to see Verdasco run out an eventual winner, 1-6 6-3 6-2 in just 75 minutes… for a three set match. I couldn’t quite understand what happened on Dolgopolov’s side, but Verdasco barely put a foot wrong in the third set and was just very solid. The advantage of staying in Eastbourne was that I could stay right up until the end of play and I took full advantage of this as I was able to get a seat in the reserved section of court 1 right on the baseline for the match between Maria Kirilenko and Bojana Jovanovski. I joined at 4-5 in the first set with Jovanovski trying to save some set points. It was by far and away the best tennis I saw all day; both players were painting the lines and making very few errors. 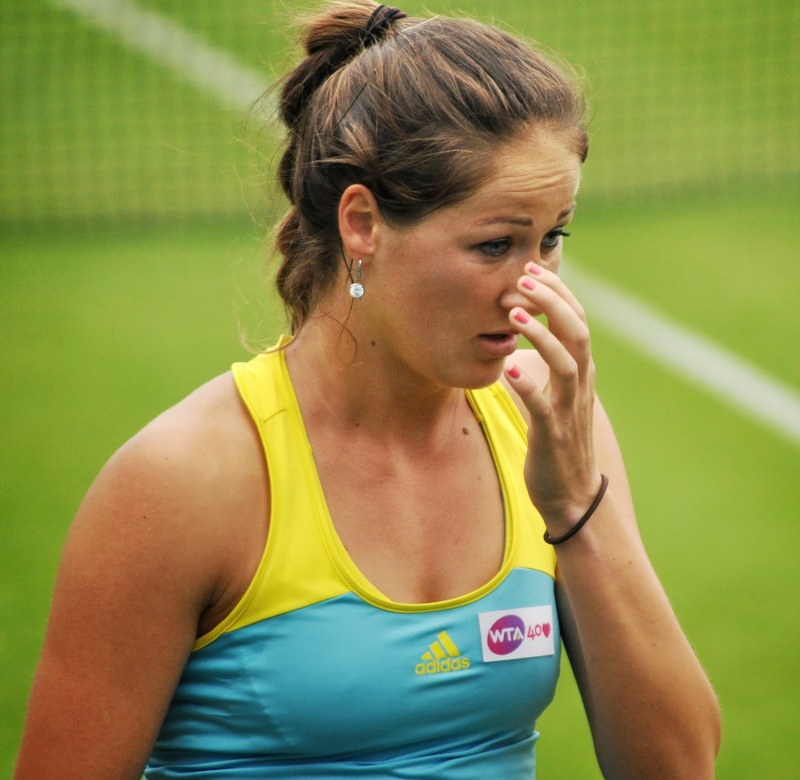 The one downside was Bojana sounding like she was being impaled after hitting each shot. I don’t like Azarenka and Sharapova’s grunts but you learn to ignore it… this was just down right annoying and it was on-off as well, making it even more frustrating to listen too. Jovanovski was completely controlling the rallies with her heavy strokes, but Kirilenko hung tough and having gone down a break at 5-6, she fought back and took the tiebreak. I left at the end of the set as both players went off the court, but Kirilenko eased through the second set to win 7-6 6-1. I finished my day under gloomy skies watching a doubles match featuring Denis Istomin and Juan Monaco against Marinko Matosevic and Martin Klizan. I joined at the end of the match, but it was a lot of fun. There was one point where Monaco and Klizan both dived for volleys and were sprawled out on the turf. Both teams had problems with the poor umpire, who took an absolute mauling. 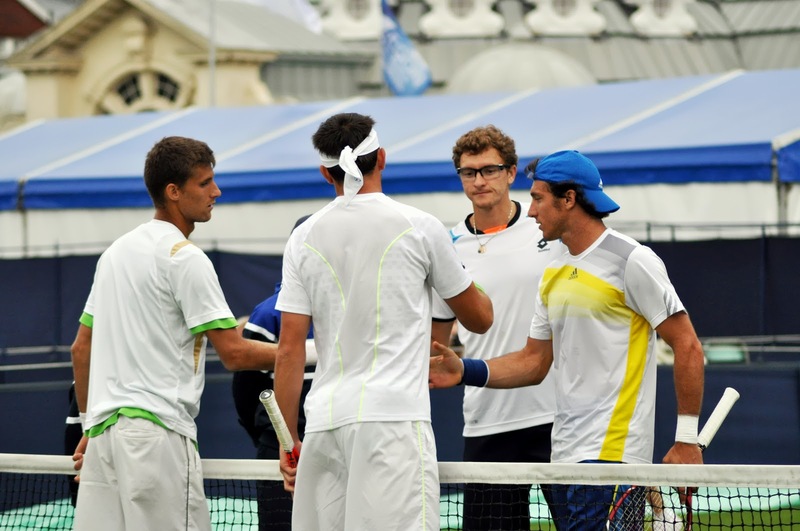 Matosevic and Klizan won in the Champions tiebreak and Istomin had words with the umpire at the end of match. 2. Former British number one and now commentator, Sam Smith arriving on the grounds with a big rucksack and walking past Elena Baltacha and asking her if she was playing tomorrow. Two ladies then asked Sam for a picture to which she responded, “i’m rather dishevelled”. 3. Christina McHale and her sister, Lauren singing Umbrella-ella-ella as i walked past them during the rain delay. 4. Mariana Alves dancing enthusiastically to the music from centre court and going up to Carlos Bernandes and giving him many kisses on the cheek. 5. 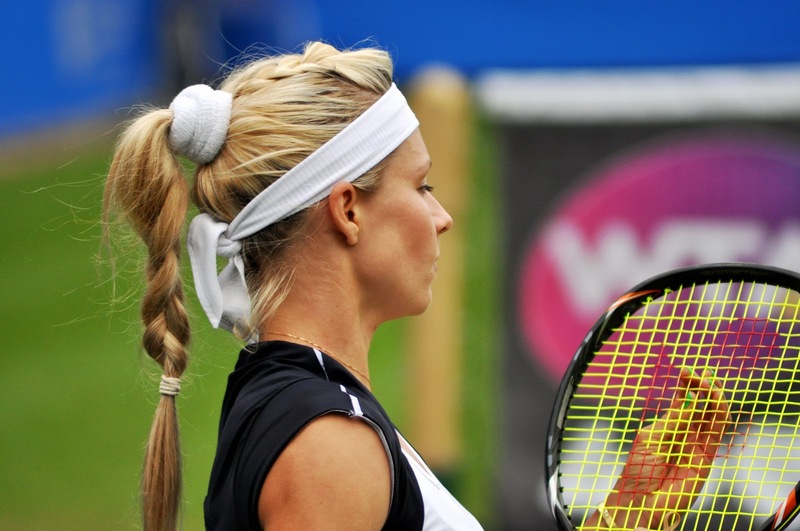 As I left Eastbourne, I walked past Yanina Wickmayer kitted out head to toe in flourescent gear. 6. Ryan Harrison watching James Blake‘s first round match and standing right in front of me as I tried to watch from a bench. 7. 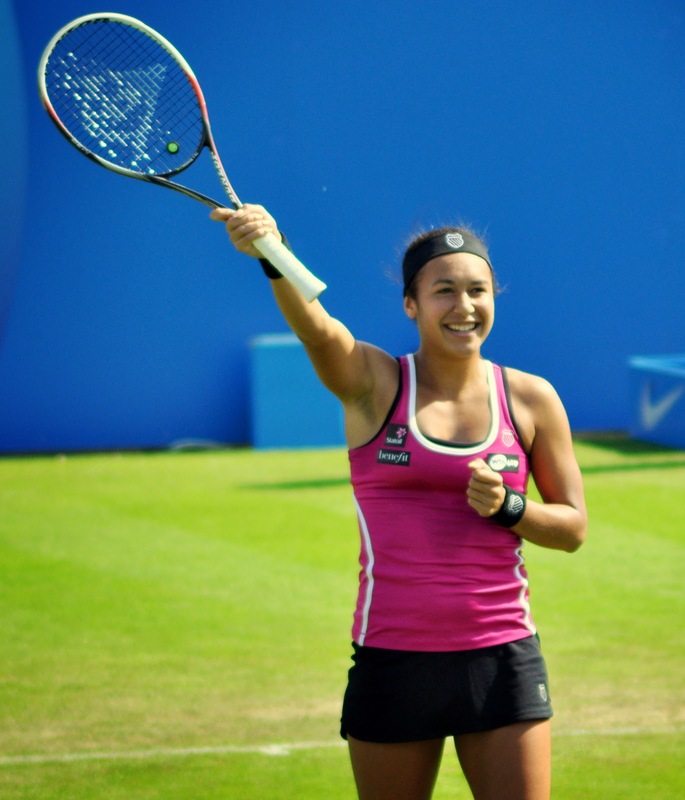 Heather Watson try and make her way through the complex, but getting hounded for autographs and grinning profusely. 8. Varvara Lepchenko walking past me and checking out my camera. 9. Walking for about five minutes along Eastbourne seafront behind Feliciano Lopez and two guys who were looking for a restaurant. They were speaking in Spanish, but I think they would discussing finding an Italian restaurant. 10. Kveta Peschke and Tamira Paszek discussing Tamira’s shoes on the practice court. COMING SOON – Part two of my adventures in Eastbourne will posted sometime next week. 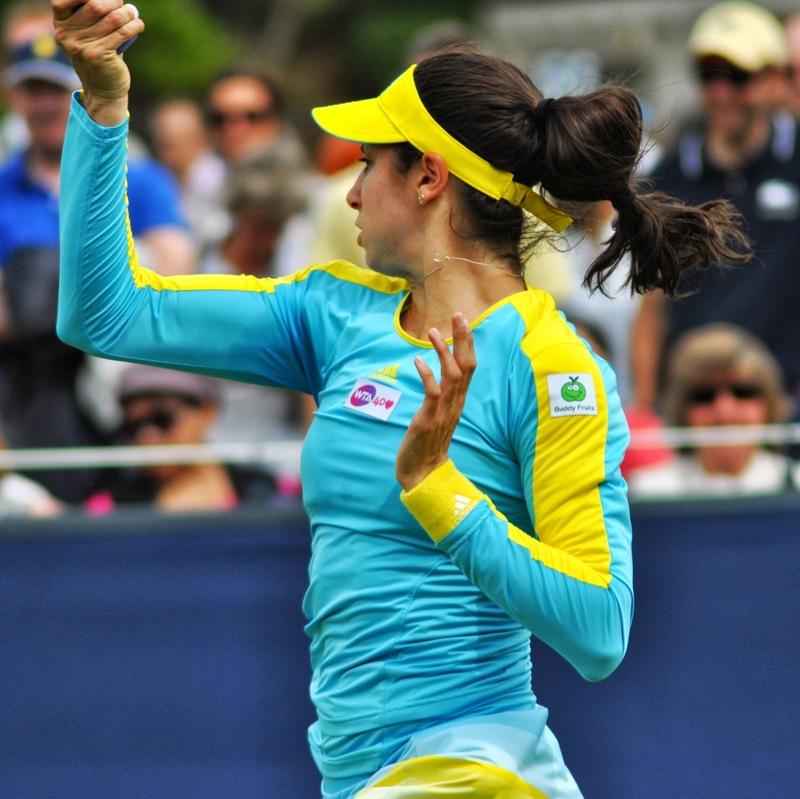 June 21, 2013 in Eastbourne. All in all,I am glad u had a great time at Eastbourne..And some of your predictions were on spot,though some may have disappointed you and us all…lolI am hoping for a very good preview and analysis of Wimbledon,i hope you get more picks right this year having observed most of the players,i feel you would be spot on..Great pictures too…Thank you for your time and blogging…Cheers…looking forward for Wimbledon and your previews..!! Found your blog about a month ago and am enjoying reading it every evening. Great stories, nice pictures and excellent analysis and understanding of game. Thank you so much for this! Thanks, Lajiao.Hope you enjoy all the previews throughout Wimbledon, it should be a fantastic two weeks! Fair point, I just felt Querrey is a touch more reliable at the minute.